It is not so much about the designer, it is all about the style, texture, color, and design. The inventory covers the style gambit, from conservative to fashion-forward. These are one-of-a-kind finds, so if you see something you like, better to snag it before it is gone! Vintage excellence! Woven silk in a gray and purple paisley. Only the "pick of the litter" best of vintage necktie selectionin our Etsy store. Gorgeous unique silk ties for every personality and style. Lavender and burnt tangerine. Pale lemon yellow with little navy and baby blue diamond details. Designer ties like Nordstrom & Robert Talbott. Vintage woven silk floral in blues and copper. Victorian antique copper crane bird Mag TAK magnetic tie tack shown. Pop Art Mod vintage Albert Nippon silk tie in gorgeous blues and purple. If you would like for us to person shop for YOUR style, Just convo us! Woven silk, XMI Platinmum. 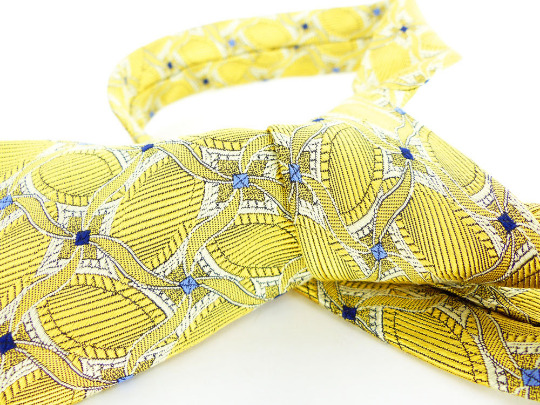 Butter yellow and navy geometric necktie, show with a cameo MagTAK, magnetic tie tack. 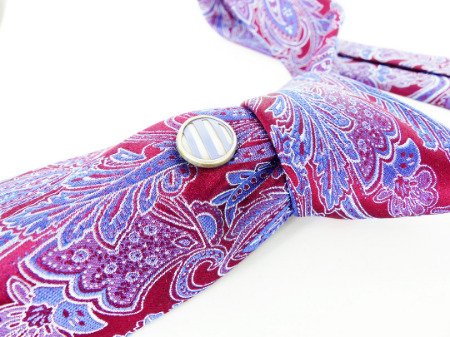 Drop dead gorgeous Beau Brummel Soho woven silk paisley shown with an upcycled Antique snap cufflink MagTAK magnetic tie tack in lavender.